Monaco has been the most expensive real estate market in the world for four consecutive years. The average property price has increased by 6% to 4.5 mln EUR in 2017. Shortage of new residential properties is being felt within all segments of the market and is pushing property values to new levels. Can this value growth be sustained and should real estate investors be attracted to the property market in Monaco amid the latest global, political and economic developments? Our research shows that overall the global real estate market is stable but not without risks. The real estate prices in luxury real estate markets–with some regional exceptions–are stable or growing and there are no visible red flags such as sharp increases in inventories. Given the unique characteristics of the Monaco real estate market, which we will cover in more detail below, could prices benefit further from the international, political and economic uncertainties? First, let’s focus on what may stir the real estate markets in the next 6-12 months. We are still at the early stages of many economic and political developments which could change consumer confidence for better or for worse. The UK with its BREXIT uncertainty, the US-initiated trade renegotiations with various trading partners, tariffs, sanctions, and other political developments with high potential for causing turbulence in the financial markets may test global economic stability. Given the complex interdependencies of global economies, no one can predict the outcome of these events and their impact on the global economy. Assuming that there will be no significant negative impacts from the above and all things will fall into place in the end, rising inflation and higher interest rates alone can put pressure on real estate prices in certain markets, including the luxury real estate segment with properties valued at 1 mln USD or more. The US has already started the tightening of its fiscal policy. It is expected that the UK and the European Central Bank (ECB) will begin to raise interest rates as well in 2018/2019. Inflationary pressure may cause more turbulence in the financial and real estate markets in the US and Europe, including the UK, influencing investors to allocate their capital to more stable environments with equal or better return on investment opportunities. Monaco is a unique luxury real estate market and one of the best, if not the best, residential investment property markets in the world due to its economic and political stability, historically high property investment yields, and a strong, long-term performance outlook. High demand for residential properties is fuelled by Ultra-High-Net-Worth-Individuals (UHNWIs) wishing to become residents of Monaco. Monaco is a magnet for wealthy business people, artists, sportsmen and women from all over the globe. Despite the global geopolitical uncertainties mentioned earlier, Wealth-X forecasts that the global ultra-wealthy population will increase to 299,000 people by 2021. The current demand for luxury apartments, penthouses, and villas is already robust and the continuous growth of the UHNWI population should add greater stability and further growth to the Monaco real estate market. Let’s look at the demand and supply characteristics of the housing market in Monaco. Political and economic stability: the Principality of Monaco is a sovereign country in Western Europe governed under a form of constitutional monarchy, with Prince Albert II as head of state. The economic growth in Monaco is mainly driven by three areas: financial services and insurance, scientific and technical activities. Unparalleled quality of life. Monaco offers a mild Mediterranean climate, clean environment, exceptional healthcare system, great schools, personal safety with the largest police force per capita, cultural events at the Opera de Monte-Carlo, the Princess Grace Theatre, Ballet of Monte Carlo, Monaco Philharmonic Orchestra, and numerous exhibitions – endless opportunities of glamour and style. Financial freedom. Unparalleled taxation policies, especially in relation to personal income tax and real estate ownership, its transfer, and capital gains. Residents of Monaco (except French nationals) do not pay personal income tax, which was abolished in 1869. Monaco doesn’t levy capital gains tax or wealth There are a number of other benefits related to local taxation laws. Stellar performance of the real estate market. 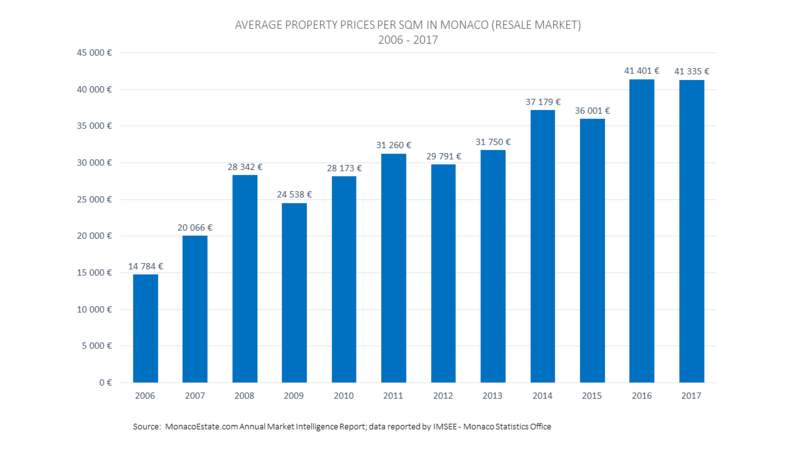 Monaco property prices have grown an average of 180% in the last 12 years (2006-2017). During this period, only short-term dips in value were recorded – generally much smaller than in other luxury real estate markets – especially during the global financial crises in 2007-2008. Yachting paradise. Monaco’s Port Hercules can accommodate super-yachts of more than 100 metres long. It draws yachting enthusiasts from all over the world to its Monaco Yacht Club and the annual Monaco Yacht Show, which is one of the most important events in the luxury yachting industry. Sports and leisure. Monaco hosts many international sporting events and activities, including the Monaco Grand Prix, Formula E, Rolex Monte-Carlo Masters, AS Monaco football games, and other cyclical as well as one-off events that bring fans together and promote active lifestyles. Size of the Principality. The size constraint of the Principality is the major factor contributing to the insufficient supply of properties to meet the needs and preferences of buyers. Despite the recent land reclamation from the sea project called Le Portier, which will add some 6 hectares of land in 2025 with newly built apartments and villas, land availability is still insufficient to keep up with the growing demand. Historical architecture. Monaco is very clever at using small strips of land to build new properties or modernizing older buildings while increasing their capacity, but the process is slow due to historical architecture; not all buildings can be demolished and replaced or modernized to make more space for the growing population of local Monagasques and new residents. Large parts of the Principality have many beautiful and historical buildings that are part of Monaco’s heritage and cannot be changed or overshadowed by other buildings to add capacity. Mountainous terrain. 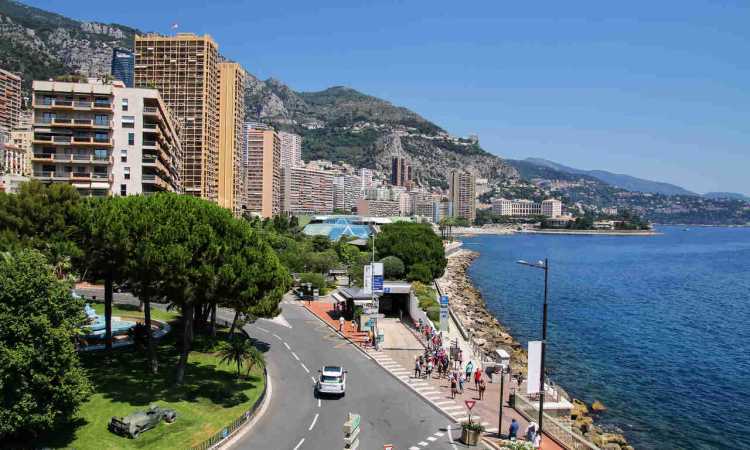 Monaco is set on a mountainside where new property development is extremely difficult and expensive; it requires good planning and skilled developers. Monaco borders with France, which requires some degree of cooperation with French authorities, especially for tall skyscrapers that may have an impact on the quality of life of its French neighbours. Long holding period. Owners of real estate in Monaco tend to hold their properties for much longer periods than in other high-end real estate markets. This behaviour, combined with the small number of newly built properties, further limits the supply of properties that meet the needs of buyers. According to the well-known investment saying, past performance does not guarantee future results, it is uncertain how the markets and consumer behaviour will interact. However, given the current real estate market characteristics in Monaco, global geopolitical uncertainty, and a growing population of ultra-wealthy families wishing to live in this peaceful and beautiful location, it seems like a safer investment option compared to other top markets such as London, New York or Hong Kong.